For vegan people staying away from dairy means, saying no to cheesecakes, which can be very difficult. Cheesecakes have always been my favorite, but having switched to vegan diet, I have found it very difficult to curb my cheesecakes cravings initially. 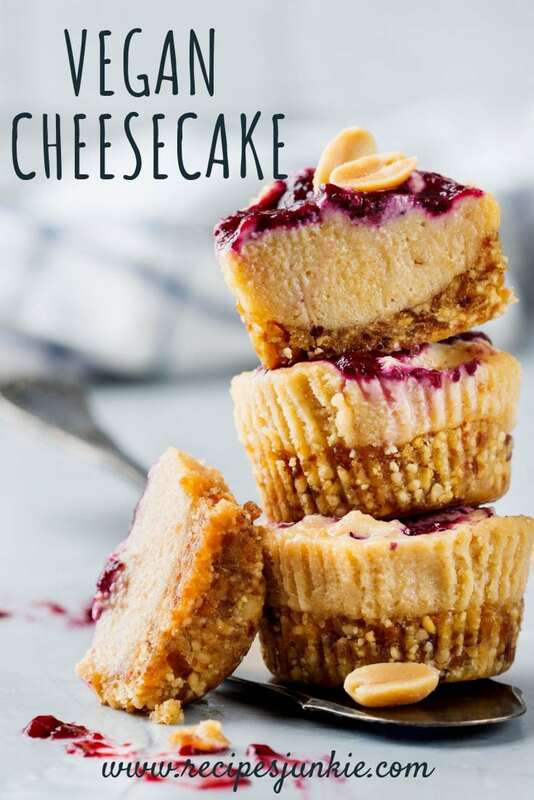 But, after a few tried and tested recipes, I now got a nice recipe from minimalistbaker about how to cook vegan cheese cake and that too with just 7 ingredients. These vegan cheesecakes are creamy and delicious to taste and satisfy your cravings for the cheesecake. The crust in this vegan cheese cake recipe is healthier and tastier compared to the graham cracker crust and the optional toppings are something to die for. This 7 ingredient vegan cheese cake begins with a 2-ingredient crust, primarily dates and raw walnuts or almonds. Mix all of these and set is aside for use later on. The next step is about the five ingredient filling, which includes coconut milk, soaked cashews, coconut oil, lemon juice, and agave nectar. 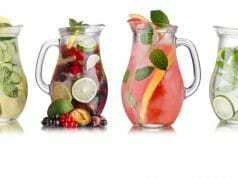 All of these ingredients are so tasty and delicious that you would want to drink it as soon as possible. The best part of this recipe is that you can pick your own favorite flavor. The cheesecakes are plain as usual, but to give it a nice twist three different flavors have been included; blueberry, bourbon caramel and peanut butter. Choose your favorite flavor and enjoy the delicious vegan cheesecake. Usually, cheesecakes are baked, but here they are placed in a freezer to set. To make it easier to take them out of the cups, you can simply cut out strips of parchment paper and make little tabs so it becomes easier to pop them out. If you don’t have parchment papers, then you can slide a butter knife along the sides to pop them out. You won’t need any special equipment to take them out; it is that easy to remove.Don’t be suspicious about cashew based vegan desserts as these are one of the best desserts I have ever had, and this coming from a cheesecake fan. Vegan cheese cakes are creamy, perfectly sweet and tart to taste, smooth and very satisfying when topped with a coconut whipped cream. So that was a lot of description about this easy vegan cheesecake, now it is time we get down to making this delicious and smooth cheesecake ideal for vegans. It is better than the original cheesecake and is perfectly a healthy and simple dessert. Add the dates into a blender and blend until the mix is smooth with some bits left. You should be able to form a ball with the blend. Remove and leave it aside. Next, add nuts and process into a meal. To this add the dates back again and blend well until loose dough is formed. The blend should stick together when you hold them a bit between your fingers. If the blend is too dry, then add a few more dates and process. If the blend on the other hand is too wet, add some more almond or walnut meal. If required you can add some salt, but this is optional and depends on your taste. Grease a standard 12 slot muffin tin lightly. To make the removal of cheesecakes easier, cut a few strips of parchment paper and lay them in the slots with their edges jutting out for ease of removal once they are frozen. Scoop a tablespoon of crust and press with fingers. To push it down, use a small glass or the back of spoon to compact it and to press it down. Add all the ingredients under filling to a blender and mix until very smooth. For coconut milk, scoop the cream off the top because it provides a rich texture. But, if it is already mixed together, then just add as it is. A good quality blender is enough for the success of this recipe. Mix for a minute, then liquefy or puree it until silky smooth. If it doesn’t come together, add a touch of more lemon juice or agave or a splash of more coconut milk liquid as this liquid will help with the blending. Taste and adjust the seasonings accordingly. If you have to add peanut butter, then blend them well in the blender until it is combined well. If you are flavoring with blueberry, strawberry or caramel, wait and top of the plain cheesecakes, this is optional though. Divide the filling evenly among the muffin tins. Tap properly to remove any air bubbles and then cover it with plastic wrap and freeze until it is hard. This will take about 4-6 hours. Once set, just shift the parchment tabs to loosen the cheesecakes or even use a butter knife to loosen them. They will easily pop out without any great effort. You can top them with a bit of caramel sauce or by adding whipped coconut cream. But, they are tastier as it is. You can keep them in the freezer for 1-2 weeks. If you want the vegan cheesecakes soft, then leave them out of the freezer for 10 minutes or eat it frozen, both ways it tastes delicious. If the dates are not sticky and moist, you can soak them in water for 10 minutes and then drain. The dates should be completely dry or else the crust will get soggy. To quick soak the cashews, pour some hot water over the cashews and soak for an hour without covering. Once done, drain and use as instructed.